Tarek Houdrouge is a partner in Schellenberg Wittmer’s banking and finance, and corporate and commercial group in Geneva. Tarek’s main areas of expertise are banking and finance, transactions and corporate law, combining banking and finance expertise with an M&A practice. He advises banks and financial institutions on regulatory matters and clients on financing and M&A, in particular involving regulated financial institutions. Tarek’s practice also covers commercial contracts and commercial transactions, including restructuring, private equity and joint ventures. 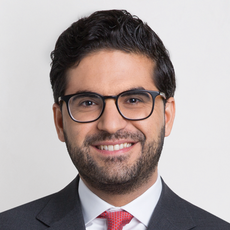 Following his Swiss Bar admission in 2006, Tarek obtained a master of laws from Northwestern University School of Law (Chicago) in 2010 and was admitted to the New York State Bar in 2011. Prior to joining Schellenberg Wittmer, where he has been a partner since 2017, Tarek worked at another big business law firm in Geneva.